Though One More Disney Day began relatively slowly at the Magic Kingdom at Walt Disney World, the 24 park hours that followed the morning’s welcome ceremony on Feb. 29, 2012 proved to be an unforgettable and unique experience for the thousands who attended. As much as I would have liked to have stayed in the park for the full 24 hours, Leap Day fell on a weekday and thus I had to leave to attend to normal, everyday matters. I left the Magic Kingdom at around 7:30 a.m., returning just after midnight. And I didn’t miss much while gone. The daytime hours of One More Disney Day were nothing more than a typical day at the park. Guests rode rides, saw shows, and met with characters. But as the day turned to night and locals left work, a seemingly normal day in February turned extraordinary. 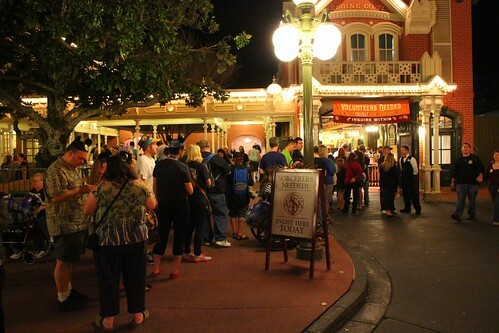 Despite some complaints of heavy crowds in the early to late evening, lines for most attractions in the late night hours after midnight were bearable, certainly busier than most nights, but nowhere near the massive turnout that showed up to Disneyland Park in California, which was also celebrating One More Disney Day. That park reached capacity early in the evening, no longer admitting guests, producing 60+ minute waits just to enter the park. One unofficial report suggests record numbers of guests visiting Disneyland that day at numbers approaching 90,000 visitors. Disney does not officially comment on attendance and as such Disneyland spokeswoman Erin Glover could only offer a general comment about the evening, telling me, “Since Leap Year added one day to the year, One More Disney Day was a 24-hour celebration, not just the extension of a regular day. This concept obviously resonated with our guests and many of them chose to celebrate the additional day at Disneyland.” Many indeed! 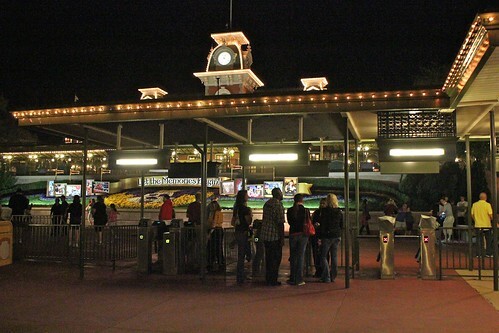 But back out here at Walt Disney World, throughout the late-night hours, the Magic Kingdom was filled with smiling faces, enjoying both the park’s regular attractions as well as the added entertainment. 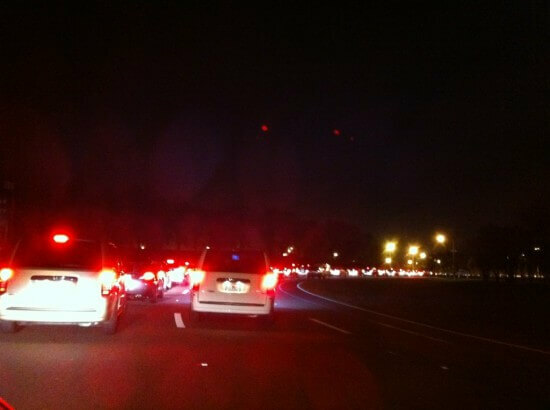 Upon arriving back to the park at around 12:30 a.m., I saw few others entering. It seemed like anyone who was going to be there was already there. Town Square told me this was no ordinary night, with the wait time to meet Mickey Mouse upwards of an hour. This would remain consistent throughout the night, stretching as high as 90 minutes. 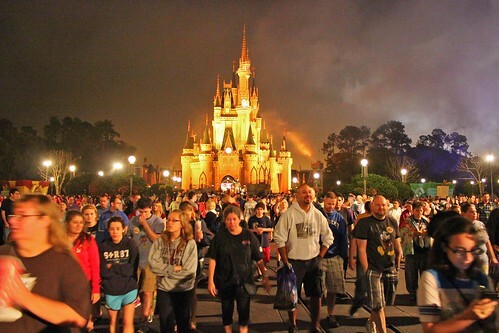 The park's newest offering, Sorcerers of the Magic Kingdom, was a hot spot for the night, with huge lines extending out of the Firehouse starting point. 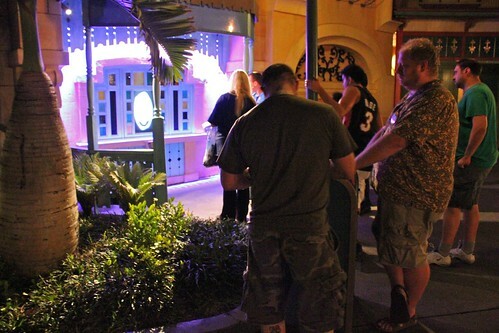 The game's magic portals throughout the park also had lines of 5-10 people in front of each one, seemingly at all times. 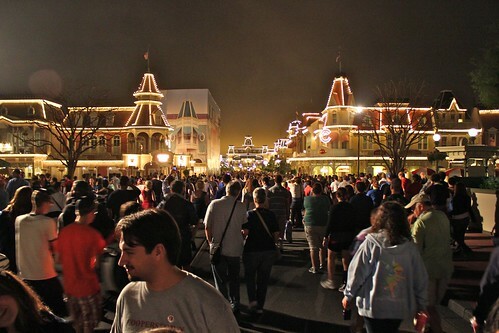 Main Street USA didn't seem overly crowded, until I realized that it was nearly 1 a.m. It was shaping up to be a very busy night to conclude One More Disney Day. 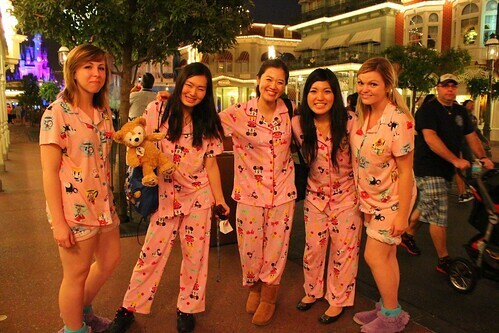 Though not the majority, some guests did show up in their pajamas, many bringing along Duffy the Disney Bear plushes to complete their Disney-themed attire. At 1 a.m., the floats from the "Move It! Shake It! Celebrate It!" street party made their way down Main Street USA and parked in front of Cinderella Castle, launching a 4+ hour dance party that drew hundreds of park guests dancing along to many of today's popular hit tunes as well as a few Disney-fied party tracks. Watch the video below to see what it was all about. The energy level was tremendous considering how late it was and how long many of these guests had been in the park, some more than 18 hours by this point. 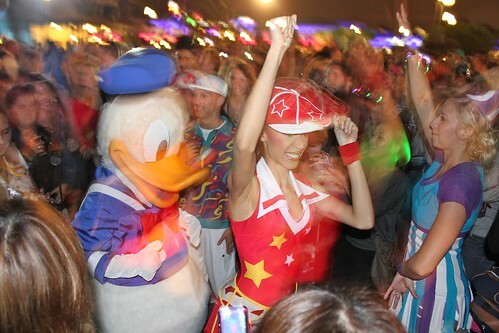 Goofy led many of the dances. 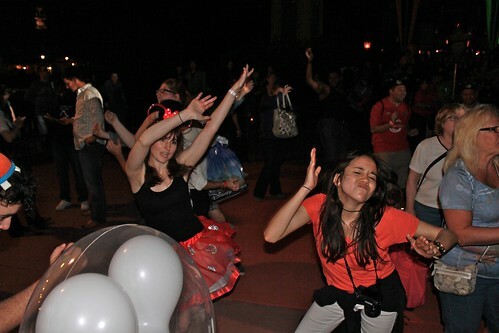 Cast Members had the most energy of all, ensuring that no guest would fall asleep in the Hub. 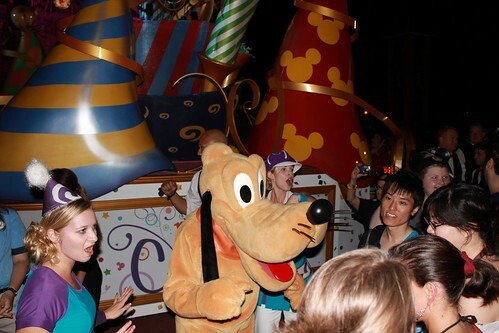 Pluto joined in the party as well, taking pictures with guests too. 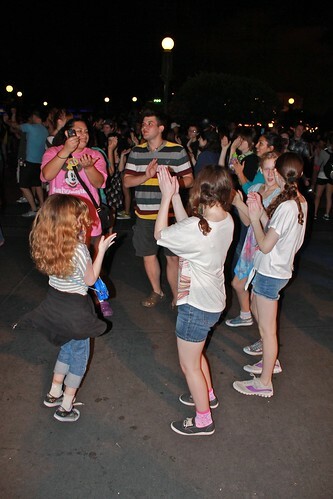 The dance party, while not your usual Disney entertainment, blasting loud hip hop music and dance beats, was definitely a hit with guests of all ages. 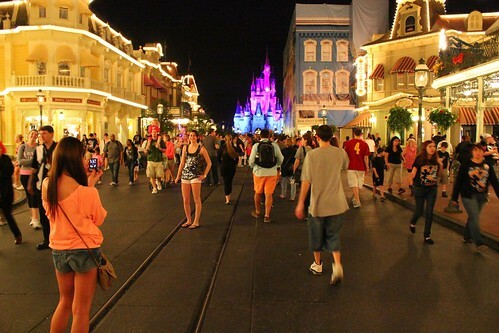 The entire Hub area in front of Cinderella Castle was completely filled with guests ready to party until closing. 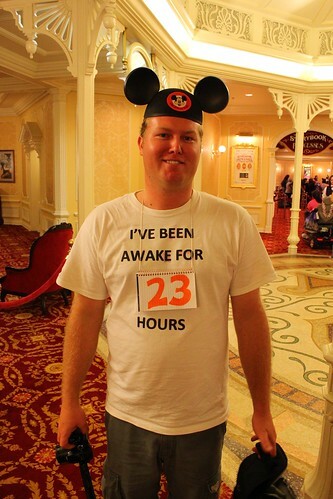 One More Disney Day was attended mostly by adults, particularly in the late-night hours, as it was a school night. But some kids seized the opportunity to have some past-their-bedtime fun. 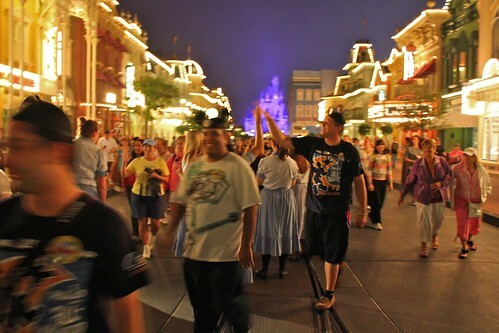 This night-blurred photo best captures the feeling of standing in the middle of the Cinderella Castle DJ dance party, with constant motion all around. 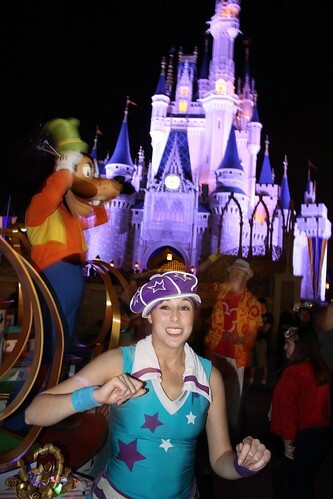 But I slipped away from that hot spot to head to our own Inside the Magic meet-up at 2 a.m. to ride The Haunted Mansion. Thanks to the 60+ people who showed up, mingled, and entered the boundless realm of the supernatural. It was fun! 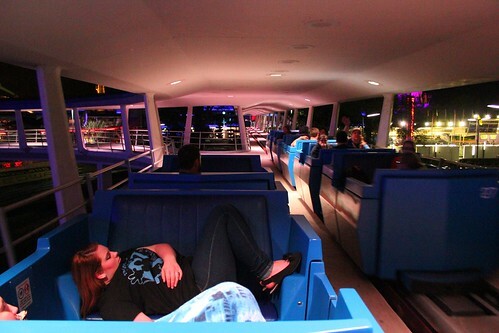 Continuing around the park, the Tomorrowland Transit Authority PeopleMover was a go-to resting place for some guests in need of a little shut-eye. It's always a relaxing trip around the future that never was, particularly after 3 a.m. 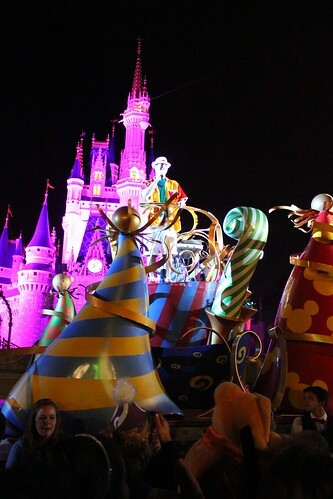 Characters were out around the park, including the Winnie the Pooh gang in front of the Mad Tea Party. 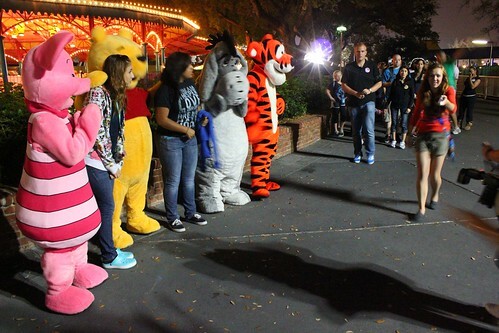 Though many rides had short lines, all of the character meet-and-greets were popular. 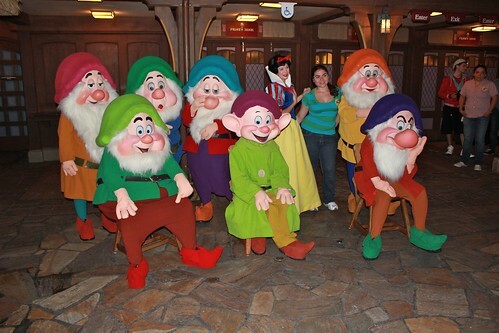 Snow White and the Seven Dwarfs normally only come out together during Disney's separately-ticketed Halloween and Christmas parties, so it was nice to see them during a 'regular' park day. 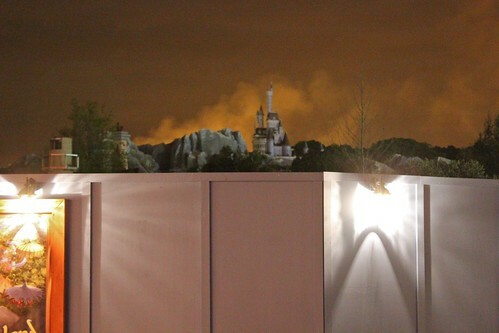 Throughout the overnight hours, moving past 4 a.m. at this point, the sky began to glow in unusual hues, gently illuminating Beast's Castle, part of the New Fantasyland expansion opening later this year. 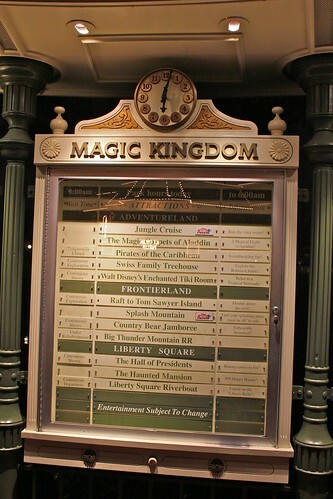 Despite the late hour, Sorcerers of the Magic Kingdom continued to be popular, with shorter lines at the Liberty Square starting point than at the Main Street Firehouse. This Adventureland magic portal glowed brightly at night, still with guests waiting to complete their sorcery. 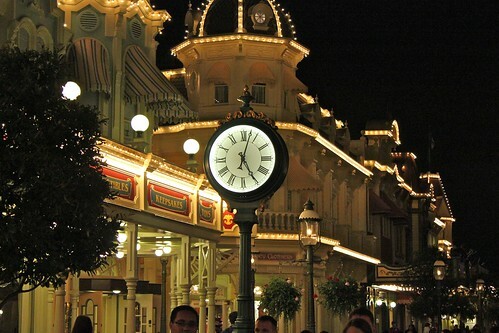 The clock continued to tick and at 5 a.m. the end of One More Disney Day was just an hour away. At this point, many guests were simply standing around, waiting for it all to end. 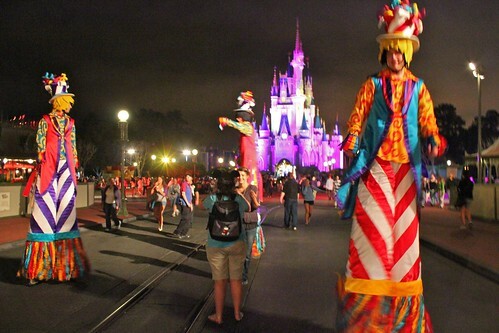 As the Cinderella Castle dance party wrapped up several hours after it had begun, stilt walkers made their way down Main Street USA. 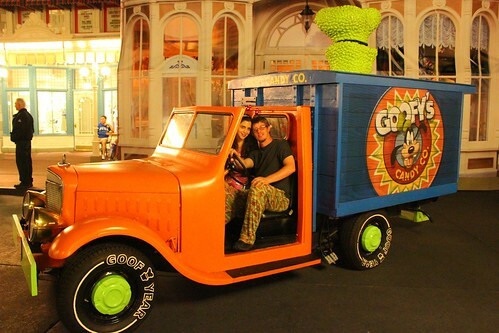 This unique photo opportunity was rolled out into Town Square: a Goofy's Candy Co. car. One guest was literally counting down the hours until One More Disney Day was over. Almost! 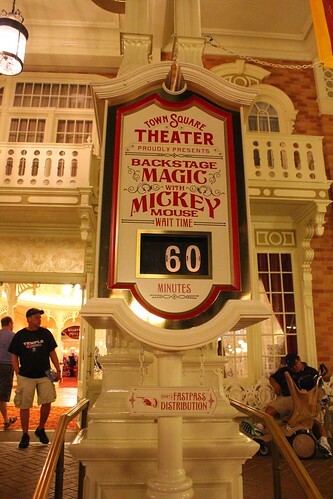 In Town Square Theater, the Mickey Mouse meet-and-greet had closed its doors just before 5 a.m. as to not require Mickey (or guests waiting to meet him) to stick around past closing at 6. 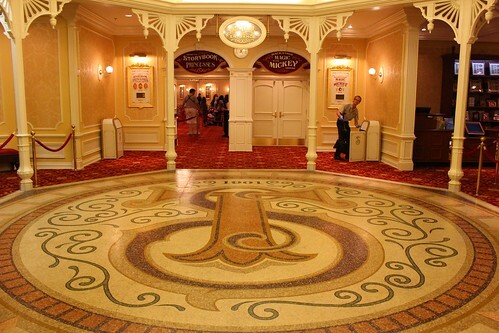 The many remaining guests inside would slowly funnel through. 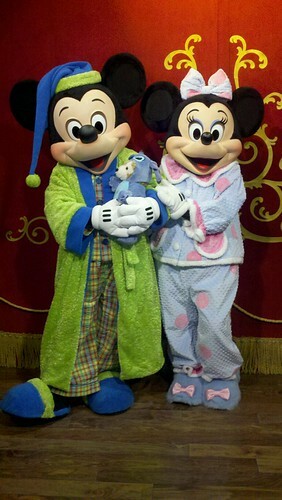 Though Mickey's meet-and-greet generally has very short wait times on a normal Magic Kingdom day, the draw on One More Disney Day was that Mickey and Minnie were dressed in their pajamas. I never did make it inside, but I was given this cute photo of the pair. 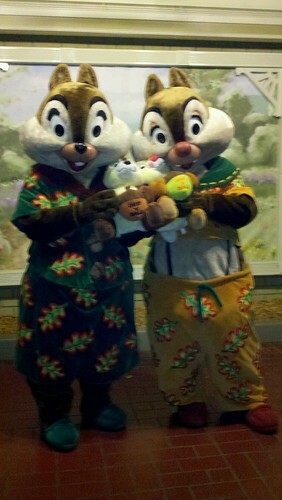 Elsewhere in the park, Chip and Dale also showed up in their pajamas. The final scheduled entertainment for One More Disney Day was an encore showing of "The Magic, the Memories, and You!" 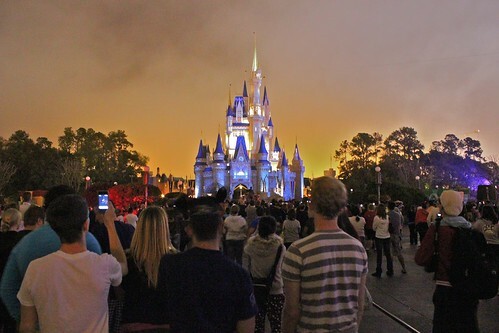 on Cinderella Castle at 5:30 a.m. Main Street was packed as the sky glowed behind Cinderella Castle during the show. 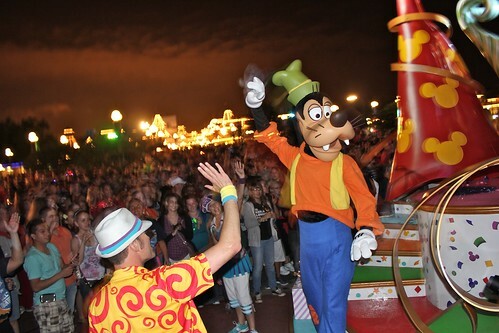 And after the show ended at around 5:40 a.m., hundreds of guests immediately turned around and headed to the exit, inexplicably abandoning the park just 20 minutes before closing. Perhaps they were all trying to beat the crowds rushing to the monorails and boats, but it seemed that everyone had the same idea. But many did stick it out until the end to see the clocks tick past 6 a.m., officially marking the end of One More Disney Day. 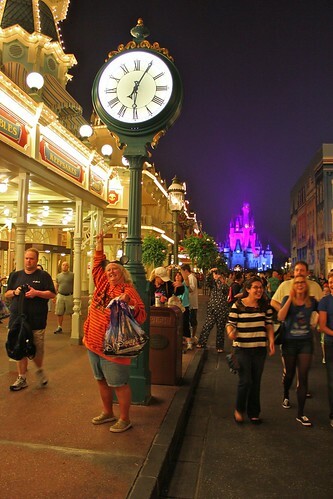 The big clock on Main Street USA was a popular photo spot for guests leaving, to commemorate their successful adventures. And on the way out, Cast Members high-fived guests, tired and excited alike, with One More Disney Day officially over. One More Disney Day ended without a bang. There was no park-wide announcement, no countdown. 6 o’clock came and went quietly as guests slowly trickled out, many dragging their feet from a long but exciting day. But it was the satisfaction of being there for the special event that resounded among those who stayed until the end. And though I only witnessed the beginning and concluding hours of One More Disney Day, it was still a special experience for me. 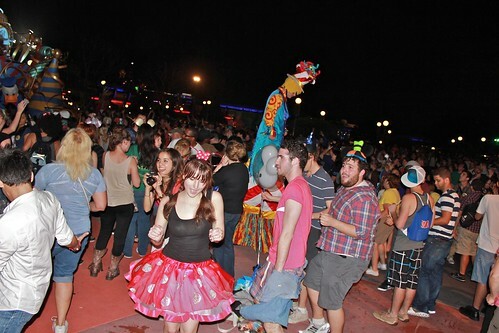 The atmosphere and energy that filled the air throughout those late-night hours was unlike no regular day in the park, with even park regulars and locals excited to be there, as if it was their first time. Though the Magic Kingdom is often open as early as 7 a.m. and as late as 3 a.m. for Extra Magic Hours, there was something special in the air for this One More Disney Day, with many hoping Disney would do it again soon – or at least sooner than the next Leap Year in four years. Though Disney isn’t saying whether the promotion was a success for them, judging by the long lines for food, thousands of special T-shirts purchased, and abundance of annual passholders and off-duty Cast Members who showed up and spent money in the park, it was likely a profitable event. And, more importantly, One More Disney Day fueled buzz across the Internet and served as one of those magical moments (even including a marriage proposal or two) that truly will be something for Disney fans to remember for years to come. it was a fantastic event! super fun. I enjoyed all of it. I tried to play SOTMK all day long but never saw the lines shorter than 6ppl. I finally did get to play a bit. Is it usually that popular? or was it just because of the Über disney fan base? It was definitely an unusual day for Sorcerers. Lines can be long, but they usually come and go. On this day, they never let up. I think it’s just because so many locals and fans came out for the special occasion. My sister and I stayed the full 24+ hours- what a blast! We were amazed that so many people were there so late and that the lines were a bit longer than anticipated, but it was such a good time. What a fantastic way to spend leap day! omg my husband and i are totally in some of those pictures and in the video! insane. Oh my gosh, I see myself in that very last picture of yours!! I’m behind the woman in yellow (the left, looking at the photo) with my One More Disney Day Mickey ears and Minnie sweatshirt 🙂 what a wonderful early morning! That’s amazing that you found yourself! Definitely a fun night/morning.